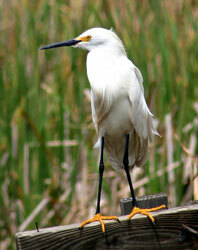 Notes by Vicki Stittleburg: A medium sized heron, the Snowy Egret is all white with a black bill, black legs, and yellow feet. They have a patch of yellow skin at the base of the bill. Immature Snowy Egrets have duller, greenish legs. In breeding season, the egret's facial skin turns reddish, its feet deepen to orange, and long plumes extend from its neck to its back. The delicate, curving breeding plumes were in high demand for the fashion industry; in 1886 these plumes were valued at $32 per ounce, which was twice the price of gold at the time. 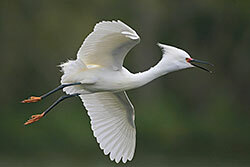 Plume-hunting nearly drove the Snowy Egret to extinction. Thanks to early conservationists who rallied to protect egrets and got legislation passed that made the feather trade illegal, Snowy Egrets were able to make a strong comeback. 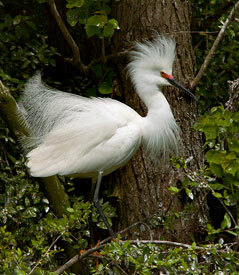 Snowy Egrets are commonly spotted along the edges of Houston's bayous and lakes. They prefer to feed in shallow water and eat mostly aquatic animals, including fish, frogs, worms, crustaceans, and insects. Using their feet to paddle in the water or probe in the mud, Snowy Egrets are able to round up prey before striking with their bills. They are also known for extending their wings over open water to create shade, which provides better visibility and may attract fish seeking shelter from the sun.